Cuban physicians visit the UI Health Mile Square Health Center in Englewood. Through a partnership with the University of Illinois at Chicago, the physicians have been observing clinical care at Mile Square Health Center, UI Health’s network of federally qualified clinics. They have also met with community leaders, including elected officials, nonprofit groups and others, to develop a picture of how health care is delivered in under-resourced communities, and how their expertise may help fill gaps in care. “The Cuban health system does preventive health very, very well, and they do it without a lot of money,” said Dr. Robert Winn, associate vice chancellor of community-based practice at UIC and director of the University of Illinois Cancer Center. Per capita, Cuba spent roughly $600 on health expenditures in 2010. In the U.S., this figure is above $8,000 for the same year, but life expectancy in the two countries was the same, at 79 years. For the past year, doctors from Cuba and researchers from the cancer center have traveled between the two countries to observe practices and exchange ideas. During the exchange, the team identified a key difference between the two countries: doctors in the U.S. do not know as much about their patients’ home life and environment. In Cuba, doctors have more insight into how the home and neighborhood affects their patients’ health. The health situation assessment tool is the cornerstone of preventive health throughout Cuban communities. In Cuba, the assessment includes questions about health — weight, exercise and medical symptoms, for example — but also an environmental analysis. Physicians in Cuba want to know if their communities have access to clean drinking water and affordable food and transportation, for example. While in the homes, doctors and nurses, with the help of medical students, can quickly assess for other factors that impact health — like allergens and dust that may trigger respiratory conditions in children, such as asthma or SIDS — or affect risk of accidents. Based on the assessment, physicians allocate their limited resources accordingly. If a community is composed of primarily young families, physicians may invest in vaccination and family-planning resources; if a significant population of the community is older, physicians may bring in resources to help minimize falls, fight cancer or facilitate transportation to medical appointments. If a community has an overabundance of standing water, mosquito remediation spraying may be ordered for that location. Kathy Tossas-Milligan, an epidemiologist, says that there is no process or individual-level assessment like this in the U.S.
Learning from the Cubans and their successful experience with the health assessment, the cancer center team at UI Health is adapting the questionnaire to a U.S. audience and testing it in Chicago’s Englewood neighborhood, which is home to roughly 25,000 Chicagoans. In Englewood, life expectancy is well below the national average at only 72 years, based on 2014 data. The average in Chicago is 77 years, and 79 years in the U.S.
Englewood is a predominantly black community with most households headed by single females. Compared with citywide rates, residents of Englewood experience four times the homicide rate and double the rate of infant mortality. Infant mortality rates are already three times higher for black babies in the U.S. than white or Latino babies. 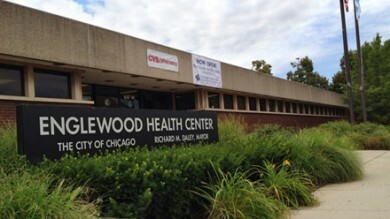 The pilot project will test the adapted health situation analysis with up to 100 reproductive age women (ages 18 to 49) and their families in Englewood. Researchers will connect with women through the Mile Square Health Center clinic in Englewood or community organizations. Women engaged in the pilot will be scheduled for a home health analysis visit, the first of its kind in the U.S. The Cuban physicians will consult with the researchers, who have been working with the Cubans since their arrival in early fall. The researchers will use the assessment to get an individual- and community-level picture of overall health, and to note the social and environmental factors that affect health and health behavior. The goal is to use the information as a foundation for enhancing provider awareness of home life and environments, and for addressing maternal health and infant mortality outcomes, such as low birth rate and pre-term births. The researchers plan to attach the information to the electronic health record and use it as the catalysts for a community debate. Following the assessment, women and families in the pilot will be stratified into one of four groups based on health risk. As practiced in Cuba, they will be recommended for a range of home and office visits based on their health assessments. For example, those assigned to a group of participants who are presumed healthy, will be recommended for one office consult. Up to three home or office visits will be recommended based on risk factors, diseases and disabilities. 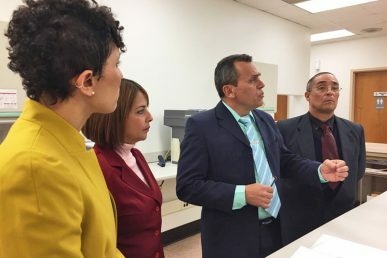 Villamarin, Dr. Berta Maria Bello Rodriguez, Dr. Sonia Maria Gonzalez Vega and Nemesis Perez Martinez, a nurse, are scheduled to be in Chicago through December. A $1 million grant from the Kellogg Foundation funds the project.